I will preface this post by stating that I really, really love my dogs. But man, can those two bark! Not a single mail carrier, small child on her way home from school, or friendly passersby goes unnoticed on my block. I do understand that they are curious creatures by nature. For dogs who don’t incessantly bark at little old ladies, there’s the Pet Peek. The hard acrylic dome window provides a way for them to be extra nosy, even if you have a completely fenced in yard. 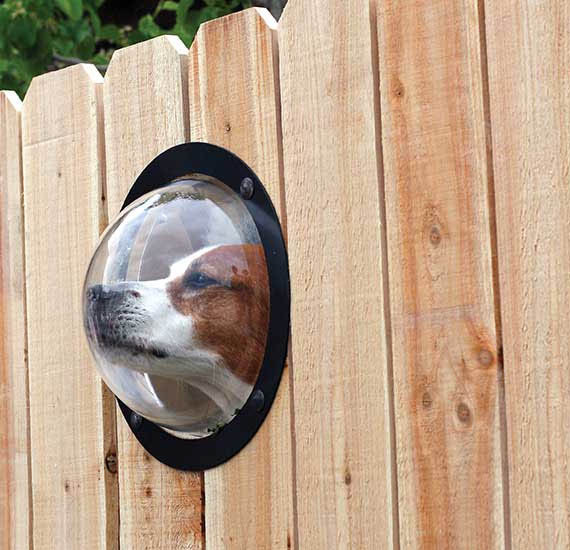 Offering ample room to poke his head through and drool while watching the squirrels, it can be easily installed into wood or vinyl fences.